The Pont de la Concorde is an arch bridge across the River Seine in Paris connecting the Quai des Tuileries at the Place de la Concorde (on the Right Bank) and the Quai d'Orsay (on the Left Bank). It has formerly been known as the Pont Louis XVI, Pont de la Révolution, Pont de la Concorde, Pont Louis XVI again during the Bourbon Restoration (1814), and again in 1830, Pont de la Concorde, the name it has retained to this day. It is served by the Metro stations Assemblée nationale and Concorde. HistoryThe architect Jean-Rodolphe Perronet was commissioned in 1787 with this new bridge. 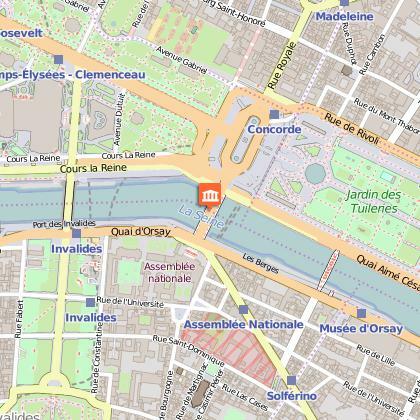 It had been planned since 1755, when construction of place Louis XV (now place de la Concorde) began, to replace the ferry that crossed the river at that point. Construction continued in the midst of the turmoil of the French Revolution, using the dimension stones taken from the demolished Bastille (taken by force on 14 July 1789) for its masonry. It was completed in 1791. In 1810, Napoléon I placed along the sides of the bridge the statues of eight French generals killed in battle during the campaigns of the First French Empire. On the Bourbon Restoration these were replaced with twelve monumental marble statues, including four of the "grands ministres" (Suger, Sully, Richelieu, Colbert), four royal generals (Du Guesclin, Bayard, Condé, Turenne) and four sailors (Duguay-Trouin, Duquesne, Suffren, Tourville). However, this collection of statues proved too heavy for the bridge, and Louis-Philippe I had them removed and transferred to Versailles. Traffic across the bridge became very congested and the bridge had to be widened on both sides between 1930 and 1932, doubling the width of the original bridge. The engineers Deval and Malet nevertheless took care to preserve the neoclassical architecture of the original. It was renovated one last time in 1983. Today, this bridge bears the brunt of Paris's road traffic (except for those of the Boulevard Périphérique).